Corsair recently announced the release of their new K70 RGB MK.2 and Strafe RGB MK.2 gaming keyboards. The keyboards come equipped with 100% Cherry MX mechanical switches with both offering a variety of switch types. 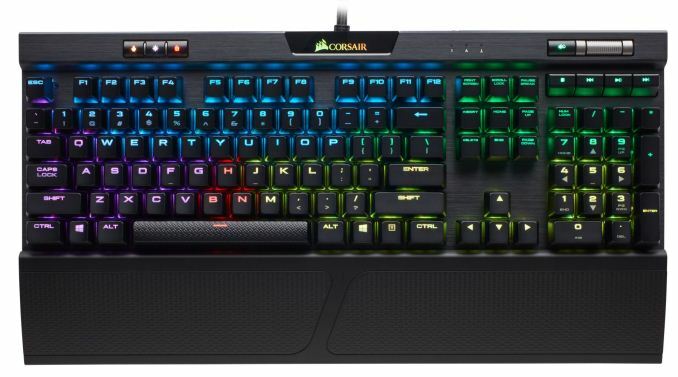 Each includes per-key RGB backlighting, dedicated media keys, and onboard profile storage for taking the configuration anywhere. 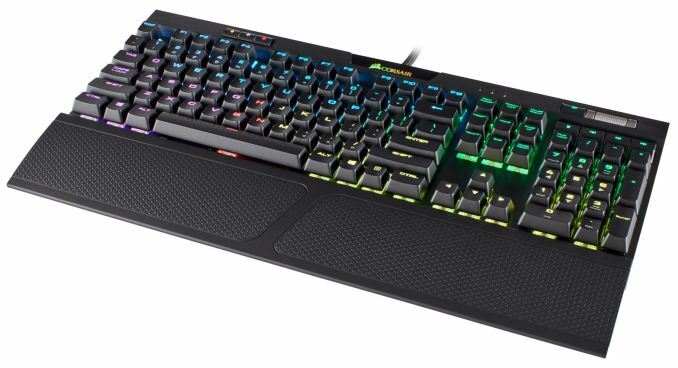 The K70 and STRAFE keyboards look to fill out more of their premium lineup of keyboards with pricing coming in at $140 on up. 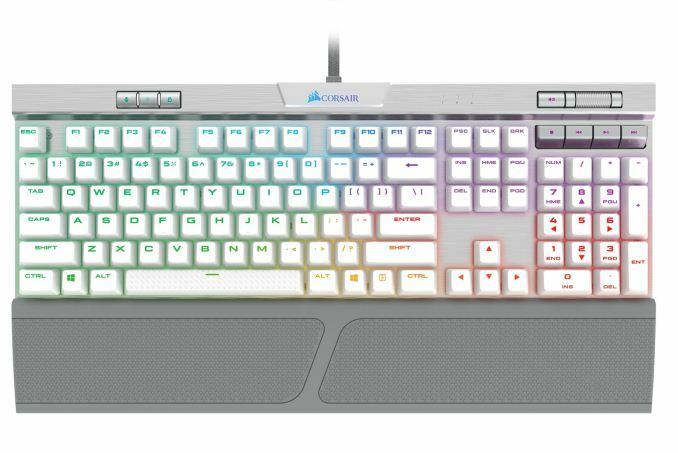 The K70 RGB MK.2 is a full-size keyboard with number pad and based around an aluminum frame that Corsair says is lightweight, rugged, and durable. The keyboard includes FPS and MOBA keycap sets that are textured and contoured for easy location of the primary ‘gaming’ keys. Along with the keycaps, the keyboard has dedicated volume and multimedia controls allowing users to quickly adjust audio without jumping out of the game. These buttons consist of a volume wheel, mute, stop, play/pause, along with forward and reverse keys. Also included is a detachable soft-touch palm rest that is 25% larger and textured to improve grip and comfort. If the black K70 RGB MK.2 doesn’t tickle your fancy, they also offer a K70 RGB MK.2 SE with a silver anodized brushed aluminum frame and white keycaps while using the Cherry MX Speed keys. The silver and white combination makes for a bright keyboard for sure. Other than that, the features are the same between the regular and SE version of the board. The K70 RGB MK.2 also has per-key programmability for macros Corsair says is for enhanced functionality. Using the iCUE software, users are able to access nine different effects as well as synchronizing with compatible Corsair peripherals for RGB illumination. It includes 8MB of onboard storage for taking macros, lighting profiles, and shortcuts wherever the keyboard goes. Key choices include Chery MX Red, Brown, Blue, Silent, and Speed keys offering users a wide variety of key types. The STRAFE RGB MK.2 keyboard is intended to be a low-noise mechanical keyboard for users who prefer silence. 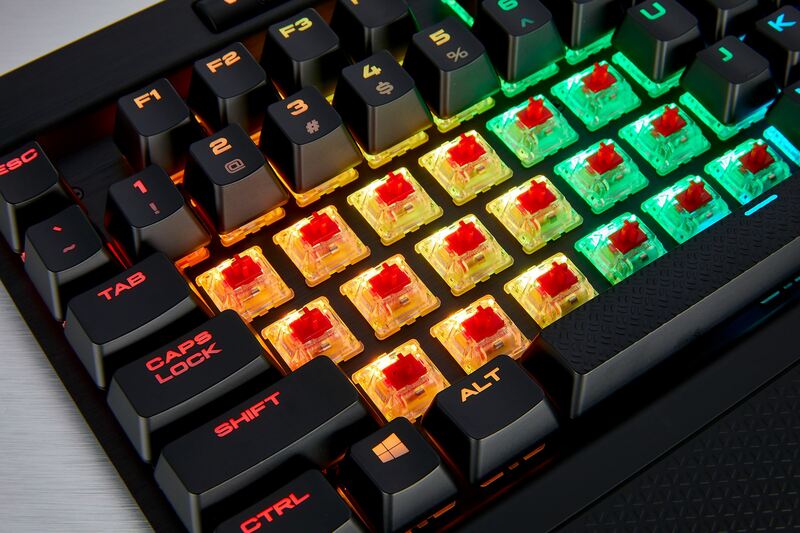 The STRAFE has options of Cherry MX Red or MX Silent keys (up to 30% reduced noise) as opposed to the K70 which gives users more choices over their switches. 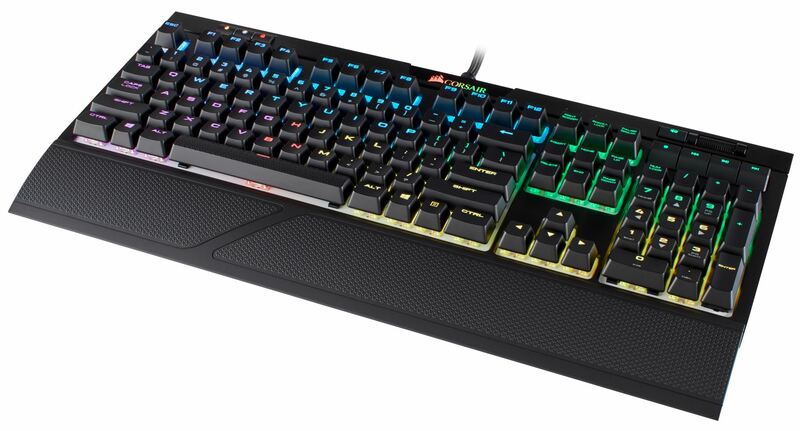 It also includes FPS and MOBA keycap sets as well as 100% anti-ghosting capabilities with full N-key rollover just as the K70 RGB MK.2 does. The STRAFE RGB MK.2 also has per-key programmability for macros and the 8MB of internal storage with its lighting handled by the iCUE software. In the end, these keyboards are quite similar with key-type being one of the few differences as well as build materials with the STRAFE using a plastic frame compared to aluminum on the K70. The biggest difference between these boards, outside of switch options and materials is in pricing. The STRAFE RGB MK.2 is priced at $140, while the K70 RGB MK.2 and K70 RGB MK.2 SE are priced higher at $170 and $180 respectively. All three boards are available now from the Corsair website and other e/retailers. I thought the original K70 had only an aluminum backplate, but the body was all plastic. For $170 now you get annodized aluminum frame, white (cause that is the trend now), and improved media and onboard profile storage (meaning a new chipset). Every LED feature mentioned was already present on the previous models, but surely the software has improved (which, surprise, has a development cost). I don't know why they continue to use a horrible font. I very much preferred (and still use!) the old Vengeance K70 fonts, whom are also used by the Cooler Master MK750 (a worthy keyboard that's only missing the volume wheel in my opinion). That being said, I don't like the numbers on top and symbols on bottom placement on the numbers row while the rest of the keyboard has the primary on bottom/shift on top, that seems to be the new standard now on most keyboards. That's a huge usability issue when not using it for gaming and it seems that no one cares at all. I thought I was the only one feeling the new font is bad, why didn’t Corsair reuse K70 font for the new MK2 but to use the ugly LUX font?? So since I’m getting a second perfect keyboard after the normal K70, I chose RGB MK2 K70 and I got a very good price online $135 with blue switches! Since then I never have to carry my keyboard to the office anymore! After swapping both keyboards’ key caps now my new RGB K70 is perfectly perfect! Elegant!! I don’t really care my K70 being ugly since I use it for gaming and home use, or I’ll get a set of cute key caps for it once I found one, but doubt so. I bet I’m one of the few to do this, I LOVE MY NEW KEYBOARD!! !